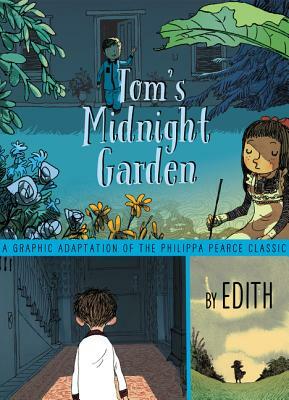 This exquisite graphic novel adaptation of Philippa Pearce’s Carnegie Medal–winning Tom’s Midnight Garden reimagines a beloved classic in a new, full-color format. With stunning art from award-winning graphic artist Edith, readers will be swept up in this transcendent story of friendship. When Tom’s brother gets sick, Tom’s shipped off to spend what he’s sure will be a boring summer with his aunt and uncle in the country. But then Tom hears the old grandfather clock in the hall chime thirteen times, and he’s transported back to an old garden where he meets a mysterious girl named Hatty. Tom returns to the garden every night to have adventures with Hatty, who grows a little older with each visit. As the summer comes to an end, Tom realizes he wants to stay in the midnight garden with Hatty forever. Winner of the Carnegie Medal, Tom’s Midnight Garden is a classic of children’s literature and a deeply satisfying time-travel mystery. This stunning graphic novel adaptation from award-winning French artist Edith transforms Philippa Pearce’s story into an engaging visual adventure. Philippa Pearce is the author of many books, several of which are considered classics both in the United States and in her native England. Her award-winning titles include Tom's Midnight Garden, which received the Carnegie Medal and was an ALA Notable Book; The Battle of Bubble and Squeak, which received the Whitbread Award; and Mrs. Cockle's Cat, which received the Kate Greenaway Medal.